Three-day workshop: The Mahatma Gandhi State Institute of Public Administration has organised a three-day training workshop for the principals of government high schools. During the inaugural ceremony, the district magistrate of Faridkot Dr S Karuna Raju stressed upon the teachers to impart good education. The commissioner of Ferozepur division Raminder Singh also spoke on the occasion. Regional coordinator of Mahatma Gandhi State Institute of Public Administration Gian Singh revealed that as many as 41 principals of the government schools participated in this workshop. 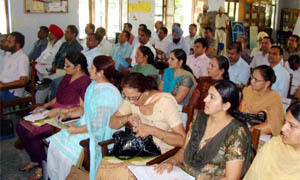 Harbans Singh Chahal, divisional education officer, Usha Kapoor, deputy director (retired) of the employment department and many other officials of the local administration and resource persons delivered lectures in the workshop. Balmiki anniversary: The anniversary of Maharishi Balmiki was celebrated here at the Bhagwan Balmiki temple at Gaushala road. Local MLA Surjit Kumar Jyani, Market Committee chairman Ashok Jairath and Municipal Council president Anil Sethi unfurled a flag atop the temple. President of the managing committee of the temple Raj Kumar Jadusankat spoke on the life of Maharishi Balmiki. Jyani announced to give Rs one lakh on behalf of the state government for the renovation of the temple. PPCC secretary Davinder Sachdeva and progressive farmer Davinder Singh Sawansukha paid obeisance at a programme organised at the Maharishi Balmiki Ashram at the local Badal Colony. department also participated in the camps. Conference: Ludhiana will host the 35th annual north zone conference of the Indian Psychiatric Society. Dr Rajeev Gupta, organising chairman of the conference, said the theme of the conference is “Challenges in Organic Psychiatry.” Almost 250 psychiatrists and mental health professionals from Punjab, Haryana, Rajasthan, Jammu and Kashmir, Himachal Pradesh and Delhi will attend the conference. Honoured: Ludhiana MP Manish Tewari honoured several meritorious Class VIII and Class XII students on the occasion of Maharishi Valmiki Jayanti. The function was organised by the Valmiki Youth Federation at Dugri Road. He also flagged a “shobha yatra” to mark the occasion. Elected: The following have been elected directors of the Land Mortgage Bank, Ludhiana: Jagdeep Singh Bittu (Dehlon); Ram Asra of Chakk village (Dakha); Satinder Singh (Koom Kalan); Balwinder Singh Tajpur (Sahnewal); Pritam Singh Umaidpuri (Model Town) and Hardeep Singh Mansooran (Pakhowal). Summit: The third HR Summit was organised by Gian Jyoti Institute of Management and Technology (GJIMT) at PHD Chamber on Saturday. The summit focused on “Enhancing Employability Skills -Exploring Gaps”. Speakers included JS Bedi, chairman of GJIMT, Satish Kumar Dhanda, Minister of State, Punjab, Nishant Saxena, CEO, Elements Akademia, Prikshit Dhanda, CEO, Making India Employable, Mehmood Khan (retd), Global Leader of Innovation, Unilever, London, and others. Stone laid: Finance, Irrigation, Forest and Environment Minister Capt Ajay Singh Yadav visited Budhpur, Kharagwas and Ladhuwas villages of Rewari segment on Friday. He laid the foundation stone of Rs 10 lakh Rajiv Gandhi Sewa Kendra at Budhpur village on Friday. The project will be constructed under the NREGA. Besides, he also listened to the residents’ grievances in the three villages and gave an assurance of speedy redressal.